Establish a baseline for current water consumption. Home > PIMs > Establish a baseline for current water consumption. All PIM content was independently developed and reviewed to be vendor-, product-, and service provider-neutral. Collect data on water consumption for the whole facility or campus for a minimum of 12 months to establish a baseline to use as a starting point for setting goals and a comparison point for evaluating future efforts and trending overall performance. This information can be compiled from monthly billings. If a facility is sub-metered, a baseline can be developed for each separately metered area in addition to the whole-building baseline, allowing you to prioritize poor-performing systems for immediate improvement. Reviewing your water data can reveal inefficiencies that would otherwise go unnoticed. Cost benefits: It is only possible to track savings after a baseline has been established. Measuring, understanding, and communicating information about water consumption tends to increase motivation to improve efficiency. Environmental benefits: Reducing potable water consumption reduces the amount withdrawn from natural water bodies, protecting the natural water cycle and decreasing strain on municipal or other sources of water supply where resources are diminishing. Reduced energy use associated with treating, supplying, and heating potable water also reduces energy-related emissions. Social benefits: Avoiding costs of wasteful and unnecessary water use saves resources that can be applied to the health care mission of a hospital. Water conservation supports environmental stewardship and healthy communities. Quality and outcomes - Metrics are in development. If you have suggestions, please contact us or participate in the discussion below. If you have suggestions for purchasing considerations, or suggested sample contract language for any product or contracted service, please participate in the discussion below. 1. Gather and track data from all water and sewer bills for a minimum of one year, but ideally for three years or more. 2. Identify and track all meters serving a facility or campus. The water utility can often help identify exact locations and services for specific meters. Note that several meters may serve one or more buildings and make sure none of these is missed. Be sure to identify submeters for cooling tower makeup water and for irrigation (which are typically used for deductions off the sewer bill). If you have an on-site well, data for use of this water should also be tracked as it contributes to overall consumption. 3. Establish a baseline year, preferably the most recent year(s) with data available for the whole year. Note any anomalies if several years’ worth of data are collected, and choose a year that is as recent as possible that does not appear to have any anomalies. Anomalies may be high or low water use due to atypically hot, cold, dry or wet weather or due to equipment or supply interruptions. 4. A simple spreadsheet can be used to tabulate bills. Use one table for each water meter. Note any tiered rate structures, as these may amplify the benefit of a water conservation project if you are able to reduce your consumption below a certain threshold. 5. Use a benchmarking tool such as the Watermark! 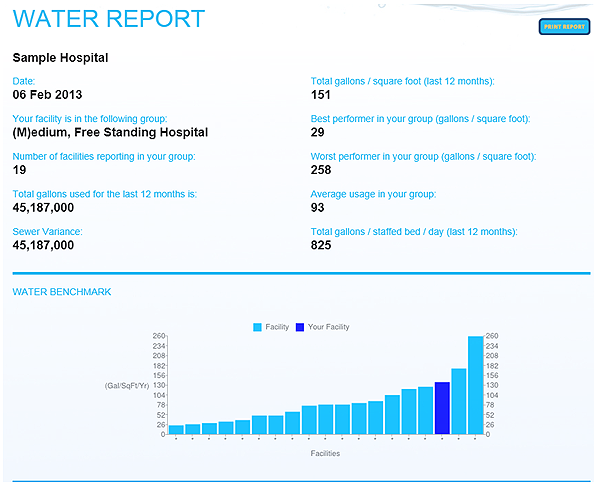 health care benchmarking tool or the water module within ENERGY STAR’s Portfolio Manager. Both tools are free and accessible. They provide metrics of gallons/bed/year, gallons/sq. ft./year, and total annual gallons. You may want to analyze additional metrics such as gallons/meal for food service departments. Watermark! has the added functionality of comparing your facility to similar facilities in the database. In addition to collecting one year of water (and sewer if desired) data for each meter, you will need to enter basic facility data to enable calculation of your facility’s baseline. Required data includes basic contact information, facility type, number of staffed beds, number of licensed beds, and square footage. Below is a screenshot of the water report you will receive after entering your data in the Watermark! database. 6. Part of the intent of the Watermark! benchmarking tool is to build a database of health care water consumption data. 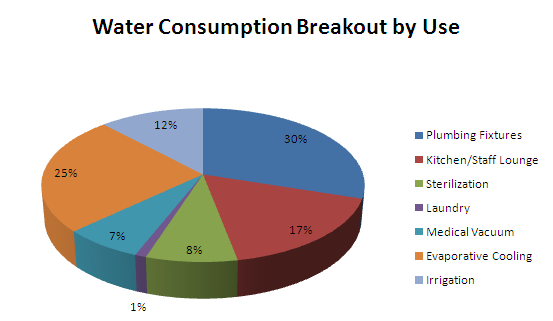 At present, detailed water consumption data for the health care industry are scarce, but information that is available shows that water consumption varies widely in hospitals across the country, ranging from less than 200 gallons/bed/day to more than 700 gallons/bed/day. Medical office buildings generally use less water than hospitals. The Practice Greenhealth 2012 Sustainability Benchmark Report documents performance data for higher performing buildings and can be a reference for identifying buildings with high water use and for setting targets. 8. Use the benchmark data as the starting point for your water conservation strategy. Target facilities or systems/processes with high water use and measure consumption after water conservation projects have been implemented to track progress over time. Refer to the Water Management Plan section of the Roadmap for specific follow-up steps after you have established your baseline. The Watermark! health care benchmarking tool is a free and growing database of health care water consumption. The tool allows facility managers and building owners to compare their facility's water consumption with that of similar buildings throughout the nation. The ENERGY STAR Portfolio Manager includes a water module to benchmark a facility’s water use and track its progress (relative to itself) over time. Log into your Portfolio Manager account to access the water module. If you have an ROI tool, calculator, or similar resources to share, please contact us or participate in the discussion below. Federal Energy Management Program: Y-12 National Security Complex Water Assessment. Emphasizes the importance of water management planning and sharing lessons learned. Massachusetts Water Resources Authority, Water Efficiency and Management for Hospitals: Newton-Wellesley Hospital Case Study. Demonstrates development and implementation of a comprehensive water management plan, including initial benchmarking. Fred Hutchinson Cancer Research Center. A multi-year program implemented to substantially reduce water, sewer, and other utility costs. Combined savings at the South Lake Union Center were estimated at 30,000 gallons per day, resulting in annual savings of close to $94,000 per year. Payback times on the various activities have ranged from one week to less than 1.5 years. At present, no known codes or ordinances require water benchmarking and tracking. However, there are indicators that more rigorous tracking and reporting of water use may be required as part of emissions reporting. For example, passage of California’s Global Warming Solutions Act of 2006 requires emissions reporting by certain types and sizes of facilities. While not currently required, there has been some movement toward reporting Scope 3 emissions related to the treatment and conveyance of water. In other words, facilities may soon be required to track their water use and report the emissions related to treating and transporting that water to their site. Refer to Climate Change Law 101 for more information on climate-related regulations. The Uniform Plumbing Code and the International Plumbing Code form the basis for most local building codes related to plumbing system design. The applicability of local building codes often depends on the scale of the retrofit. Various ASHRAE standards can provide information on water-saving improvements for HVAC systems and equipment. Due to the urgency of water conservation in California, the state has led the way from a regulatory perspective. Reference documents include the Water Conservation Act of 2009 and the 20x2020 Water Conservation Plan. Look into your state’s water conservation regulations. Facilities Net has compiled a list of some existing regional ordinances. Test and treat water quality to maximize cooling tower efficiency. Eliminate fixture, equipment and piping leaks. Optimize ice machine water usage. Insulate hot water system equipment and piping. Minimize water used for laundry washing. Minimize water use for irrigation and grounds maintenance. If you have any information or resources to contribute, please contact us or participate in the discussion below. The American Water Works Association publishes a guidance manual for water audits, leak detection, and water loss control programs: Water Audits and Loss Control Program. The EPA WaterSense at Work guide includes instructions for assessing facility water use and sample worksheets for water management planning (the latter in Appendix B). The Practice Greenhealth 2012 Sustainability Benchmark Report provides water consumption benchmarks that can serve as a good reference for gauging a facility’s performance and for setting targets for water use. Interested in underwriting this PIM? Contact us to find out how! Comment, and please add information, tools, or additional resources you think should be added to the PIM. Write a case study or a PIM to contribute to the Roadmap (links are to instructions). ©2010-2015 by the American Hospital Association. All rights reserved.